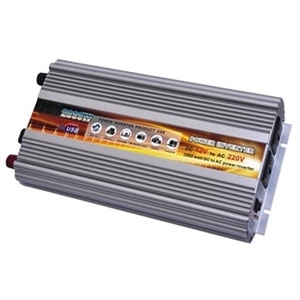 2000w power inverter for car to power printer, hair dryer etc. Perfect device for inverting 12v DC to 120v/220v AC on a car, direct sale by manufacturer with low price. 2000 watt car power inverter for printer, hair dryer, laptop etc. Tips: Where is a modified wave inverter being used? Modified sine wave (or quasi sine wave) can be divided into several types, from the square wave to rounded trapezoidal wave (close to sine wave). Most modified sine wave inverters in the market are square wave. These modified sine wave inverters can be used for laptop, computer, television, video camera, digital camera, printer, chargers, game console, DVD player, portable DVD, home treatment device and so on, the big size inverters can be for small electric appliances such as hair dryer, electric cup, kitchen appliances etc. But for inductive electrical appliances such as refrigerator, electric drill, it's not recommended to use a modified sine wave inverter for a long time, otherwise, it may cause damage or shorten the life expectancy of the inverter and the electrical products.